Meet with friends at the High Line, an urban park built on an elevated rail line that runs over 15 blocks from the Meatpacking District to the bottom of Hell's Kitchen. Walk across this 1.5-mile hybrid space of lush gardens, park benches, art installations, and trails, and get a glimpse of the impressive views of the Hudson River and the Statue of Liberty. With many entrance points along the way, enjoy all the fun things to do around the High Line including endless sports and recreation at Chelsea Piers or shopping and dining at the Chelsea Market. Winter: December 1 - March 31: 7:00 a.m. - 7 p.m.
Spring: April 1 - May 31: 7:00 a.m. - 10:00 p.m.
Summer: June 1 - September 30: 7:00 a.m. - 11 p.m.
What is there to do on the High Line? 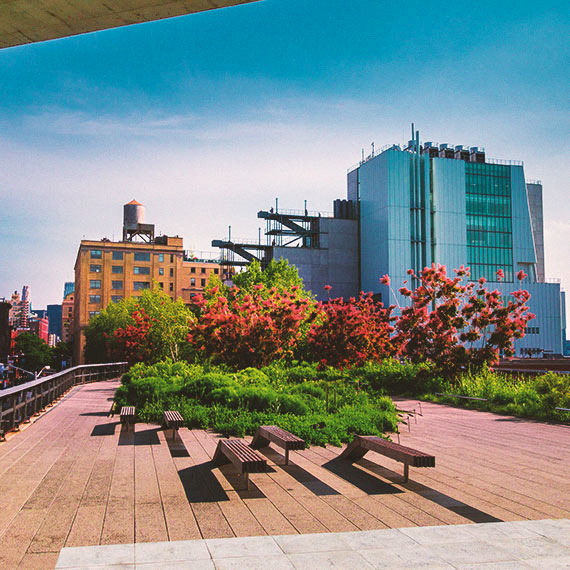 After enjoying the scenic views from this one-of-a-kind park, take advantage of all there is to do all around the High Line. Grab lunch at the Chelsea Market, peruse the local art galleries, hit the batting cages at Chelsea Piers, see a live musical performance at the High Line Ballroom, or simply rest and people watch at the 10th Avenue Square and overlook. How long is the High Line walk? The High Line stretches 1.45 miles long above Gansevoort Street in the Meatpacking District to West 34th Street, between 10th and 12th Avenues. It typically takes anywhere from 10-20 minutes to walk depending on your pace, not including stops to take in the Hudson River views, artwork, and gardens.